International truce monitors in Sri Lanka have held emergency talks with Tamil Tiger rebels after a sea battle the government says left dozens dead. The European peace monitors blamed the rebels for a "gross violation" of the 2002 ceasefire in Thursday's violence. The government says 17 troops and more than 40 rebels died in a Tiger suicide sea attack near Jaffna. 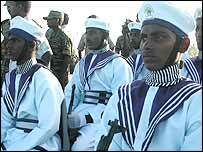 The Tigers say the navy attacked them and have now warned peace monitors not to board navy vessels. They also said only four of their cadre members were killed. The Sri Lanka Monitoring Mission (SLMM) said at least one of its team was in the navy convoy. The team said in a statement: "This sort of reckless behaviour can only lead to a dangerous escalation resulting in growing hostilities and jeopardising any possibility for future peace talks." The Sri Lankan government says it is still committed to restoring peace. "On the part of our government it is our duty and we feel it is the right thing to do to pursue peace as civilised citizens," senior government minister Keheliya Rambukwella told the BBC. SLMM spokeswoman Helen Olafsdottir blamed the Tigers for provoking the navy. "It's very clear that the Sea Tigers have no rights at sea - we have ruled it here in this mission that this is a government-controlled area, because non-state actors cannot control sea and open waters so this is a very, very serious ceasefire violation." But the political head of the Tamil Tigers, SP Thamilselvan, strongly rejected the claim the Tigers had no rights at sea. In a letter to the SLMM, he said the Tigers had a right to naval movements as part of the balance of power. He said the Tigers were "exercising in the seas adjacent to our land areas... when [navy] vessels attempted to interfere with our movements and attacked us". The Tigers said truce monitors were being used as human shields by the Sri Lankan navy. They warned observers not to board navy vessels and that if they did, the Tigers would not be responsible for the consequences. "We have repeatedly informed the SLMM that we will retaliate if SLN [Sri Lankan Navy] vessels intercept us," the rebels said. "For this reason we have warned and requested the SLMM Naval Monitors to refrain from boarding SLN vessels. "The government said 15 small Tigers boats attacked a navy convoy escorting a troop carrier. The rebels said the Sri Lankan air force had bombed Tiger territory near Kilinochchi soon after the sea battle. "They fired more than a hundred artillery rounds from multibarrelled rockets onto civilian areas," a spokesman for the rebels, Sivaratnam Puleedevan, told the BBC. Local journalists said Sri Lankan armed forces had also fired artillery shells and some rockets from the direction of the Trincomalee harbour towards Tamil Tiger-controlled areas in the north-eastern province. About 200 people have died in soaring violence in the past month alone. More than 60,000 people have been killed in Sri Lanka since the Tigers launched their campaign for a separate state in the north and east of the country in 1983.